No matter how much money you’ve invested into your door system, without regular maintenance you cannot get your money’s worth! Anyone can spot a frayed or broken cable or spring, or a misalignment of tracks - they can be seen with the naked eye. However, our technicians are trained to look for problems that might concern door components that a regular person might know nothing about. They will inspect end bearings, the center bearing, stationary and set cones, rollers and hinges, electrical components, nuts and bolts, and last, but not least, the exterior frame and weather stripping. After inspection comes lubrication, tightening, adjusting and fine tuning. Our team will let you know what needs to be repaired or replaced if they find anything amiss, and will inform you of the things you can do to keep the system running smoothly. There are a few types of cables: torsion, extension and safety cables. 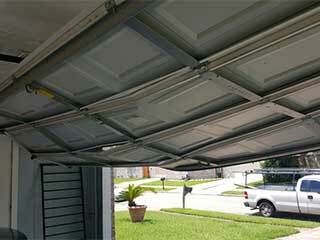 Although they may not seem important, they are an essential safety mechanism of a garage door. If a spring breaks it will recoil with such force that it can cause damage to your car or even injure or kill a person. However, a cable running through the spring will prevent that from happening. This is why cables must be free of rust and frays and wound around the drum correctly. You can cause more damage by continuing to operate the door with a broken cable. Let our team replace it and avoid the additional repair costs and any injuries. Not only do garage doors protect you from weather conditions and uninvited guests, but they also have built-in safety features that save lives. Garage door openers that meet UL 325 standards must have an auto reverse feature, meaning that the door will change its direction if there is an object blocking its downward path. Photoelectric sensors are, in fact, motion detectors - if the infrared beam is broken by anything or anyone, the door should stop and go back up. Manual controls enable you to override the door opener and they need to work properly in case of an opener malfunction or power outage. Call Garage Door Repair Orlando to test these safety features for you and make any necessary adjustments and repairs.